As soon as I saw this book related the closed quarters feel of Clue, I knew I was in for a treat. While there was definitely some interesting connections, there is a lot more going on in the book than just the classic mystery. 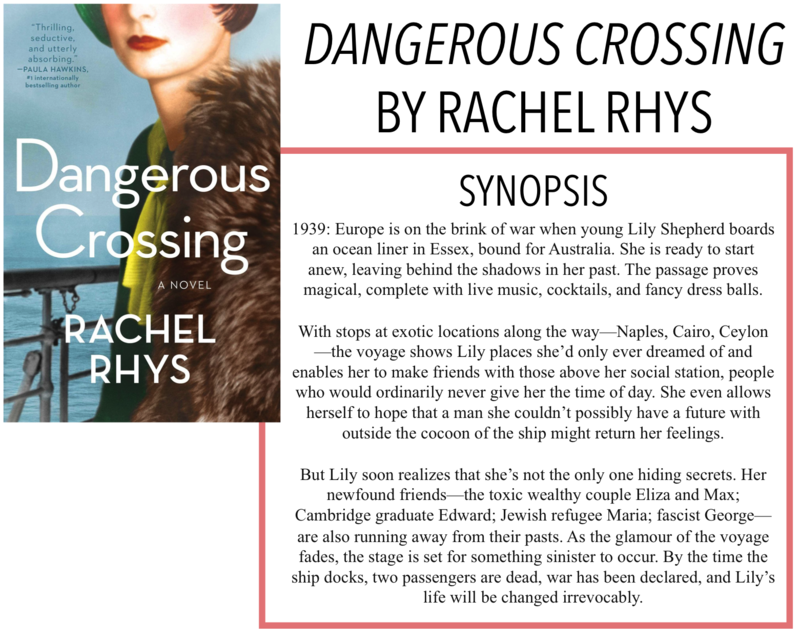 I'm back with another book review, today it is Dangerous Crossing by Rachel Rhys. Thanks so much to Simon and Schuster Canada for providing me with an ARC of this book for an honest review. As always, all opinions are my own. This story follows Lily, a young woman who has decided to take part in the government assisted voyage from London to Australia in the late summer of 1939. 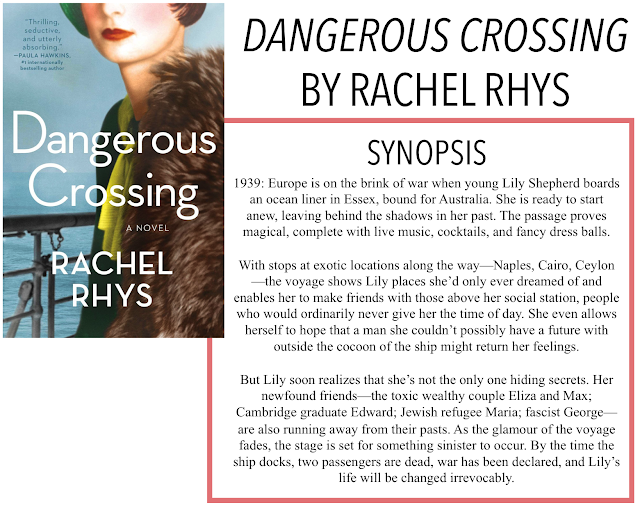 Lily meets many new people on board the ship, including the Fletcher siblings; Edward and Helena, Jewish refugee Maria, Fascist George, and an intoxicating couple; Max and Eliza Campbell. As personalities clash and tensions rise with the promise of war on the horizon, the passengers begin to clash. When the ship lands in Australia on September 4, 1939, two people are dead and the war has just broken out. I suppose this is a historical thriller, which is a genre I'm not really used to reading but was excited by the concept of. I'm not entirely sure if Lily as the character of this book existed, but the author's note talks about the inspiration for this novel coming from true events. I really enjoyed the historical elements of the story, especially in this time period. The threat of WWII was imminent and characters of all different nations were aboard the boat. There were definitely some social and racial issues that were brought up, especially between George and Maria. I almost wish Rhys had pushed things a little bit further with some of these issues. She brought them up but didn't really have the characters take a position on them. People were obviously racist to Maria, but the characters largely accepted this behaviour. I know that at the time that sort of thing would be accepted, but Rhys set Lily up to be a fairly open-minded and modern character, it's a shame she didn't push a little further. I sort of figured out what was going on with some of the characters, I was a little off, but I think once you find out there are conservative parents involved who disapprove, there are only so many things it could be. I know that's a little vague, but I don't want to give anything away. While this was an interesting storyline, I feel that without the prologue to keep this story in suspense, I'm not sure I would have been that invested. Other than the historical interest, this book wasn't as gripping and suspenseful as I wanted it to be. It's one of those stories where you know something happens but you don't know who or what is really involved. This concept, however, is really only useful in keeping one's attention for a short amount of time before the plot has to take over. I'm just not sure the plot ever really did. I enjoyed following the ship's journey and each of the ports. Rhys did a good job of exploring the destinations along the way, but after a while, they started to blend together and lose their unique characteristics. They all just became a foreign, hot place with people trying to hock their goods in broken English. Overall, I think I enjoyed this book, but there were just some parts that didn't seem to fit and felt a little off.